Thomas Jefferson was the 3rd President of the United States who served in office from March 4, 1801 to March 4, 1809. What was the life of Thomas Jefferson like? The short biography of President Thomas Jefferson covers important information and facts about his early life, his family, career and the famous events and achievements of his political life. 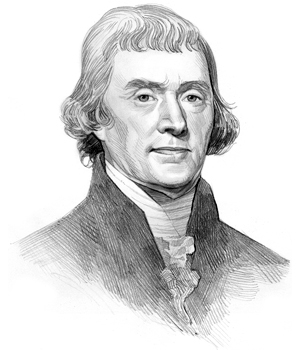 Our short biography of Thomas Jefferson provides an interesting and easy way to learn about the life of the President. The following important facts provide a fast overview of important facts about President Thomas Jefferson. Facts and Info: Thomas Jefferson was the third president of America and most famous as the Author of the Declaration of Independence and for his negotiation of the Louisiana Purchase with France which doubled the size of the United States. For additional info refer to 20 Facts about Thomas Jefferson. Facts and Info: He was born on April 13, 1743 in Albermarle County, Virginia. He was named after his grandfather, Thomas Jefferson II, a prominent landowner, militia captain, and justice of Chesterfield County, Virginia. Thomas Jefferson was raised on the family farm to a wealthy family and enjoyed the company of his six sisters and three brothers. He died on July 4th, 1826 in Monticello in Virginia. Facts and Info: The career of Thomas Jefferson included the roles of Lawyer, Politician and Statesman. He was such a good writer that he was one of five men chosen to write the Declaration of Independence. Jefferson's library of approximately 6,000 books became the basis of the Library of Congress. He became the 3rd US president in 1801 and served for 8 years until 1809. His wife died 19 years before he became president, so there was no "First Lady". Facts and Info: Thomas Jefferson married Martha Wayles Skelton on New Year's Day in 1772 and they lived on his 5000 acre plantation, Montecello. Martha died 12 years later. They had 6 children but only Martha and her younger sister Mary survived to adulthood. On her death bed Martha asked her husband to promise that he would never re-marry. Thomas Jefferson kept his promise which led to a 38-year relationship with his mixed-race slave Sally Hemings with whom he fathered six children. His daughter, Martha Jefferson Randolph assumed the duties of the First Lady. Facts and Info: Thomas Jefferson belonged to the Democratic-Republican Political Party. He was 57 years old when he was inaugurated as the third president. Aaron Burr and George Clinton stood as Vice presidents. During his presidency he worked tirelessly to keep the United States out of the French Napoleonic Wars. For additional facts refer to his Presidential Cabinet members. Short Biography of Thomas Jefferson: What he was like! Facts and Info: Thomas Jefferson was an imposing figure standing at 6 feet 2.5 inches. He owned slaves which was common for men of his standing during his era. Thomas Jefferson initiated the custom of a president shaking hands, rather than bowing, to greet guests. His vibrant red hair turned sandy, then white as he grew older. A 60-foot (18 meter) sculpture of his head is carved into Mount Rushmore as a monument to his many achievements. Facts and Info: During his lifetime he played a key role in important events of the era. Thomas Jefferson was instrumental in drafting the Declaration of Independence. During his presidency he led the nation to victory in the Barbary Wars between the US and North Africa's Barbary States and negotiated the Louisiana Purchase of 1803 with France which doubled the size of the United States. Facts and Info: During his life Thomas Jefferson suffered from Tuberculosis, an infectious bacterial disease that primarily affects the lungs. Tuberculosis was also known as “consumption” or the “white plague” reflecting the deadly nature of the disease, which was the cause of more deaths in America than any other during the 19th century. Facts and Info: Thomas Jefferson died of of natural causes, most likely dehydration resulting from dysentery, at the age of 84. His death occurred on July 4, 1826 in Monticello in Virginia and was buried at the family estate in Charlottesville. Thomas Jefferson and John Adams died within a few hours of each other on the 50th anniversary of the signing of the Declaration of Independence, July 4, 1826. The short biography of Thomas Jefferson provides a fast overview of the key facts and events about his life and the accomplishments of his presidential term in office. The following Thomas Jefferson video enables you to sit back and listen to the history of his personal and political life - a useful educational resource for kids, children and schools learning about the life of President Thomas Jefferson.